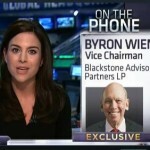 Speaking to CNBC’s Jackie DeAngelis, Byron Wien, Vice Chairman, Blackstone Advisory Partners, said he believed the market was setting up for a major sell-off in an interview Thursday. Wien stated the market was getting ahead of itself; this along with the 4th quarter GDP report being very disappointing. “Almost every analyst out there thinks earnings are going to be up this year; I think earnings are going to be down this year,” Wien said. “Profit margins are peaking and revenue growth is going to be relatively slow, and I think the market is being driven right now by the ample liquidity that the Federal Reserve is providing,” Wien added. “The market can continue to go up because so much of this liquidity is finding its way into financial assets, but eventually the corporate fundamentals take over and I think they are going to be disappointing,” Wien concluded.